The Boston Bruins welcomed Tyler Seguin to his old digs at the TD Garden just in time to see him net his seventh career hat trick against the club that traded him on July 4, 2013. The home team (and Boston’s penalty killing effort) suffered a brutal loss not only on the scoreboard, but on its active roster as well when veteran two-way forward went down early in the first period when Chris Kelly’s left leg buckled under him in a non-contact situation. He stayed down a long time and was eventually hoisted up off the ice by Zdeno Chara and left the surface without putting any weight on his left leg. In the third period, Don Sweeney broke the bad news: Kelly is lost for the rest of the season as Don Sweeney announced he has a left femur fracture. Kelly’s absence showed, with the Bruins surrendering three power play goals in a 5-2 loss, but it was a game the B’s could have won with a more consistent performance across the entire 60 minutes after a solid start. Seguin opened scoring with a missile off the rush from the left circle, beating Tuukka Rask in the 1st period to give Dallas the lead after the Bruins had gotten off to a hot start with six shots to none before he found the back of the net with his club’s first on net. Colin Miller answered for the Bruins, rifling home his first career NHL goal from the point to make it a 1-1 game. “Chiller” has demonstrated a heavy shot that he can get off quickly and on net. Loui Eriksson tallied a power play goal (his third of the season and 10th point in 11 games) off of a rebound of Torey Krug’s slapper from the left circle. Patrice Bergeron also assisted on the play, giving the Bruins a 2-1 lead after 20 minutes. Seguin scored a power play marker in the second frame, stepping into the left circle and firing a heater past Rask with Jamie Benn set up in front taking away his sight lines. Dallas took the lead with a point shot from Jyrki Jokipakka, who scored his first career NHL goal (in some 62 games) to make it 3-2. Seguin tallied the hat trick again on the power play when Krug was whistled for a delay of game penalty after clearing the puck over the glass. Seguin took a Jason Spezza pass in the left circle once again and burying a one-timer before Rask could get across his crease. It was Seguin’s eighth tally of the year and gave the Stars a 4-2 lead. Defenseman Alex Goligoski would add another power play marker to put the game out of reach. The story of this one centers around the loss of Kelly, who was transported to Mass General Hospital and will have surgery tomorrow and then is expected to miss six to eight months. For all intents and purposes, Kelly’s season is done, and now one wonders if the team will look to Max Talbot to fill the void. Seguin’s hat trick no doubt added some salt to the wounds in Boston, but credit the Stars for recovering from a mediocre first period after playing the night before in a loss to Toronto to turn the tables on Boston in the final 40 minutes. The Bruins outshot Dallas 39-19, but the scoreboard bore the message of Boston’s defeat: 5-3, visiting team. Alex Khokhlachev showed some flashes of ability and hustle in his first NHL game of 15-16, but when the B’s found themselves on the PK, he didn’t get much time on ice. Loui Eriksson- Two goals tonight including a meaningless late-game score on a give-and-go with Ryan Spooner to make it a 5-3 game with a little over two minutes remaining. Eriksson has been a consistent bright spot on offense. His four goals this season have come in two games on a pair of two-goal efforts, but he’s added seven assists in 11 games as well. With Kelly gone, Eriksson’s value to the team as one of the more experienced and effective two-way forwards is even greater. Colin Miller- The defenseman acquired in the trade for Milan Lucic continues to generate offense, scoring his first goal on a point blast. With his tools and knack for creating scoring chances from the back end, Boston fans have to be excited for this young man’s future. 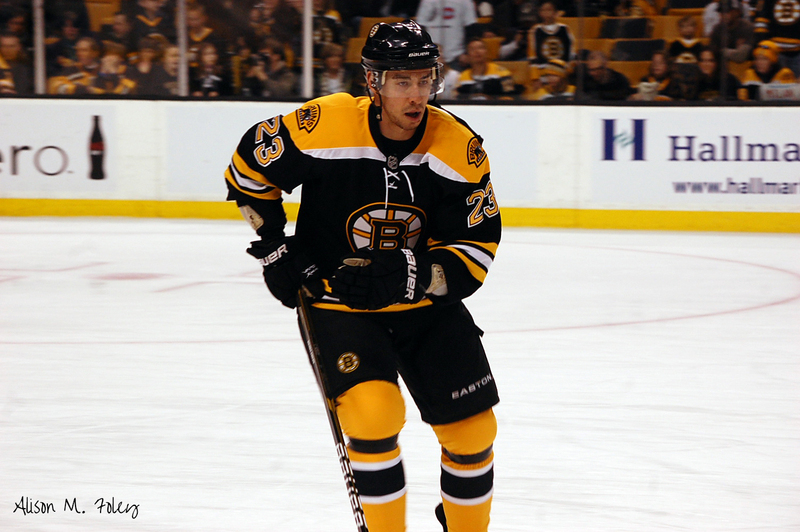 Chris Kelly- B’s fans will now learn how much more the veteran did for the club that he didn’t get credit for. It is the ultimate in irony for a player of Kelly’s character to be lost on such a random play…he wasn’t blown up on a big hit. It was a freak injury with devastating effect. He gets an up because throughout his Boston tenure, he’s been a leader and gritty two-way performer. It’s a tough pill for Boston to swallow right now. Tyler Seguin- What more can you say about his performance? The former Bruin and 2010 second overall selection used his wicked shot and high-end offensive talent to lethal effect tonight, overcoming the fact that Boston held the statistical edge in most categories except in the one that matters most: the final score. The trade that sent him to Dallas will continue to polarize B’s fans for years to come, but Seguin still needs to demonstrate he can perform at this level and higher come February and beyond when it gets tougher to score in the NHL and points are at a premium. He deserves full marks for his three goals in this one, and becomes the first former Bruins player to score a hat trick in Boston since Mariusz Czerkawski did it with the Edmonton Oilers on November 6, 1996. Jamie Benn- He’s a tremendous player and the chemistry Benn has with Seguin is admirable. He not only gets the big-time points production and consistent scoring, but he does the little things, like go to the net and set up a screen as he did on Seguin’s second goal. These two have been dynamite together, but with the way things have gone this season, 2015-16 just might be the real breakthrough year by both players as they are on pace to raise the bar. Boston’s penalty kill- They gave up three goals on four Stars attempts and were at their worst when they appeared to stop skating on Seguin’s hat trick goal, thinking the puck left the zone. It didn’t, thanks a strong play at the blue line by John Klingberg and seconds later, the Stars were up by two. It’s not going to get any easier with Kelly now gone for the balance of the season. Watch for Max Talbot to come back up and try to fill those skates. Tuukka Rask- He’s gotten credit when he plays well, and he goes back on this list when he comes up short. The Bruins needed him to make the first save tonight and he wasn’t up to the task. Sure- the defense had some breakdowns in front of him, but he was off his angles and at times made it easy for Dallas, especially on the Goligoski goal, where he seemed to lose his poise and focus. Team effort tonight- and the Bruins lost as a team, but Rask needs to be better. Zac Rinaldo- As the John C. McGinley Bob asked Tom “Leap to Conclusions Mat” Symanski on Office Space “What would you say…you do here?” Energy is good, hitting is fine, but Rinaldo is no threat to generate any kind of consistent offensive pressure, so what he brings to the table simply does not balance out what the team could better get from someone else on the roster. Antoine Roussel- A slew foot AND a high stick on Zac Rinaldo? On the same play? If ever there was someone who could out-rat Rinaldo, it’s Roussel. Tough loss in what was a winnable game for the Bruins in what is going to be a challenging week, as the team loses in regulation for the first time since the Columbus Day match against Tampa Bay.